Drought can be sadly common in some areas but it becomes a freak occurrence when severe drought slams the same places for three consecutive years, particularly if said areas were once flowing with water. Yunnan Province, well-known for its tropical rain forests, meets these criteria. "We have never experienced such drought before and my family's income has tanked," Zhang Baoyou told the Global Times in his tobacco field, while he sprayed pesticide on tobacco leaves in scorching heat. Cigarettes are an important source of income for Yunnan and Zhang is one of many tobacco farmers from Zhanyi county in the city of Qujing. Having grown tobacco for over 20 years, Zhang tills 0.4 hectares of the crop, and netted an income of 12,000 yuan ($1,882) a year until the area became beleaguered by severe drought in the autumn of 2009. "In the past two years, I only made 3,000 yuan in net income to feed my family of four, outside of manual labor I have done on the side," said Zhang. As a farmer, his family's destiny is determined by how much it rains, and his village has poor water storage facilities. Zhang's situation is understood by Li Qinxian, 50, a driver in Zhanyi county. Li used to be a farmer and knows how hard life is for them, especially during years of unusually hard drought. "My family just needs water to live, and the drought hasn't had as much influence on us as it has on Zhang," she said. Zhang said those in his village have enough water for their own personal use, but are far from able to irrigate their fields and crops. Zhang's life has been affected greatly, but his situation is not as bad as that of those living in remote mountain areas,who do not have enough water to survive. By late May, people who needed water to survive in Qujing amounted to a 10th of its total population of 6 million, reads a brief report from the Office of Drought Relief for Qujing. On top of this, about a fifth of its population needs some level of help, with many in this group lacking food due to the drought. According to the report, this drought is the most serious to blight the district since 1961. All of the nine cities and counties that make up Qujing have suffered an absence of rain. Across all of Yunnan, over 8 million people have been seriously affected, and over half have difficulty in getting drinking water, according to statistics from a working conference for drought relief in March. Due to the lack of precipitation, the water stored in Qujing's 672 State-owned reservoirs only amounted to 190 million cubic meters by late May. "This level represents only 20 percent of the water that was stored before the drought happened," said Zha Gang, vice director of the office for drought relief for Qujing. The office is a temporary organization which is responsible for coordinating work between different departments. Zha told the Global Times that although the entirety of the water stored had reached 370 million cubic meters, just 170 million cubic meters were designated to be used, with the rest kept back to guarantee the safety and operational capacity of the reservoirs. To encourage more storage of water, officials who manage reservoirs will be rewarded if the level increases, and farmers will get subsidies if they can fill up small dams or ponds. Furthermore, the local government have set up "water stations" to ensure no residents have to travel more than five kilometers to fetch water, said Zha. Local people are also encouraged to become migrant workers, a policy that seems to be having a major effect as around 25 percent of local residents had left the area by 2011. "Not all migrant workers are poor people, but we encourage more to leave temporarily considering the current situation," said Zha. Limited access to water has also led quarrels or outright fights between farmers to spiral. Officials have had to step in to help resolve over 1,500 disputes since the drought broke out. Zhang Baoyou is not aware that a major cause for the drought has been wholesale destruction of entire swathes of rainforest, an essential part of the local ecological structure. However, he can see that almost every mountainside around his village is dotted with thirsty eucalyptus trees. "We know the trees 'drink' too much water, and they are still there, but what can we do?" another tobacco farmer asked, adding that the land where the trees are planted has cracked due to being so parched. A lack of rain has added to a perfect storm of causes due to the destruction of green cover, the eucalyptus tree invasion and the failure of the reservoirs, said Na Zhongyuan, director with Yunnan Institute for Ecological Agriculture, based in Kunming, capital of Yunnan Province. As the need for paper grows, eucalyptus trees, which are essential to the papermaking industry, have been planted massively in Yunnan Province. The province is mountainous and poor families have turned to the trees for quick riches, despite warnings being given by experts in the early days. Most eucalyptus trees planted in Yunnan have come from Australia. However, Australia's climate differs vastly from China's and it has enough moisture in the air that the trees do not need to depend so much on underground water tables, according to media reports. In Yunnan, the trees are simply unsuited to this environment. Their mass plantation can make the soil barren, as evidenced by the lack of weeds around them in Yunnan, and they can also kill off native species. In short, they are an unmitigated ecological disaster. Na said rain forests have been deforested for a decade, with rubber trees often replacing them in Xishuangbanna, to the south of Yunnan. Rubber trees have been another plant species that has consumed water, with their ground cover reaching 410,000 hectares in 2006, five times of the area in 1998. Eucalyptus and rubber trees do not store water. Instead, they absorb large quantities of it, destroying the rainforests' function in conserving water supplies, purifying the air and regulating the climate, Na explained. The unrestricted planting of eucalyptus trees all over Yunnan resulted in the draining of underground water tables, said Na. As for the reservoirs, Na said they are supposed to function well in three aspects: flood control, drought relief and regulation of water run-offs. However, at the moment, they are not storing water during rainy seasons, which Na says "runs completely counter to the original purpose for their construction." "Those who manage reservoirs only care about themselves, and don't shoulder any responsibilities when the reservoirs are empty," said Na. Na's opinion is shared by Ma Jun, director with Institute of Public and Environmental Affairs, a non-profit organization based in Beijing. "When the ecological system is fine, disasters can be prohibited, but once it is destroyed, the situation will be devastating," said Ma, adding that while floods are easy to predict during rainy seasons, situations of severe drought can creep up unexpectedly. Yunnan is a mountainous area, and only a high percentage of forest cover can maintain enough underground water, which is also necessary to ensure rainfall, said Ma. Ma said this trend of ecological degradation needs to be restrained at all costs before economic and human losses spiral. The construction of new large-scale reservoirs would go some way toward helping, but would be too limited to bring relief to people living in remoter areas. "More small-scale reservoirs should be built to help people once drought starts," said Ma to the Global Times. To Na, it is the functionality of large-scale reservoirs that is of the highest import. "Generating electricity is just one function as is well-known. But a less well-known function is just as important, namely maintaining the ecological balance," said Na. The goal of improving the capacity of the reservoirs is becoming to pick up traction. An official with the Water Resources Department of Yunnan Province told media in 2010 that none of the province's small-scale reservoirs had ever been repaired. Besides, some smaller water sources such as ponds have no funds to maintain them and are not properly supervised or managed, which means they are drained even more easily than small-scale reservoirs. Reservoirs are not the only issue. "When the silt from dams is cleared, they can hold more water, and dams being dry provide a good opportunity to do this. However, no one does the job [clearing silt] or even thinks to speak out on such relatively simple relief efforts," said Na. He laments that more often than not, slogans to fight against drought are "sung," rather than being applied to specific practical measures. 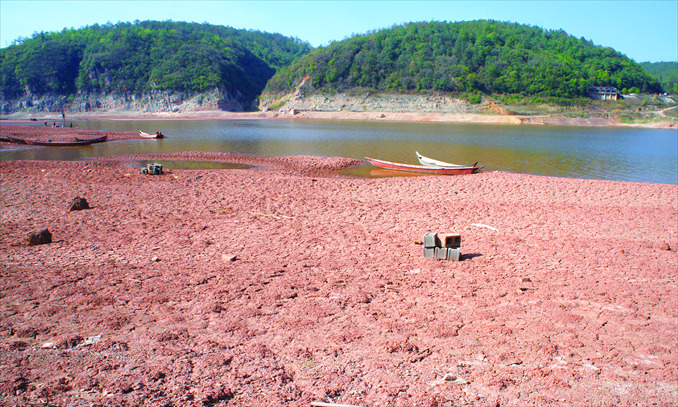 Repeated attempts to get a comment from the Yunnan Water Resources Department on the drought conditions and the relief measures being taken went unanswered by publishing time. Both Zhang Baoyou and other villagers told the Global Times that they would have no hope if it didn't rain soon. They have dug a well not far from their farmland, but the water tables are so drained it has not helped much. They hope the government will come to their rescue and build better water conservation facilities which would allow them to irrigate their farmland and hope to survive through this drought seemingly without end.